We’ve gotten used to purple carrots, orange cauliflower, and blue poinsettias, but who would have expected a rainbow rose? At first glance, these roses look fake. Although they are actually living roses, they are not hybrid crosses between different colored flowers, the way most new shades of flowers are created. 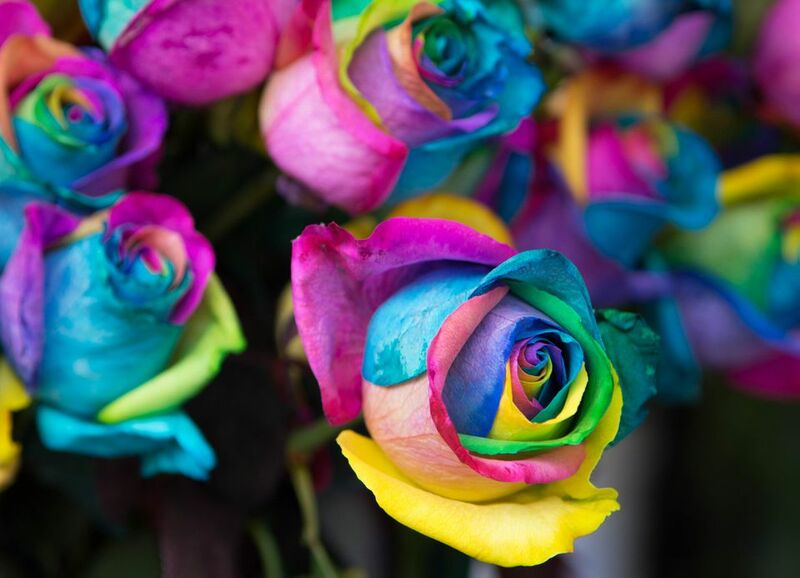 The petals of rainbow roses have been injected with dye, and the rainbow effect is only one outcome possible with this process. These brightly colored blossoms are the result of some very clever work by a Dutch grower named Peter Van de Werken. Looking to expand the market demand for cut flowers, Van de Werken and his colleagues began experimenting with developing new colors of roses, chrysanthemums, carnations, and a few other flowers. They began with white flowers and initially tried simply spraying the dye on the petals, the way they do with blue poinsettias, but the results were less than satisfactory. Then Van de Werken came up with the idea of having the flowers take up dye through their vascular systems. Getting dye to absorb its way up the flower stem and out to the petals is not an easy task. For starters, most dyes contain molecules that are too large to work their way out to the delicate petals. There is also the problem of toxicity when introducing a foreign substance into the plant. However, after much trial and error, special dyes made from plant extracts succeeded in changing the petal colors vividly enough to make it worthwhile. Initially, the roses were dyed a single unusual color by immersing the stem in a container of dye. Creating the rainbow effect requires an even more complicated process, which Van de Werken’s company is closely guarding and trying to patent. Can You Grow Your Own Rainbow Roses? Perhaps you’ve seen rainbow rose seeds for sale that promise to grow into brightly colored roses. Unfortunately, rainbow roses need to be created, not grown. As mentioned, rainbow roses are not the result of crossing two different colored roses, and even if they were, hybrid plants do not grow true to seed until they have been stabilized. The seeds being offered are just a scam. However, you can try and color some roses yourself. You probably won’t get the vivid colors Van de Werken produced because his team isn't releasing the details of the dye or the procedure, but since it is basically osmosis, you will be able to make a reasonable facsimile. Start with a white rose. Choose one where the bud is just starting to open. If the bud is too tight, it may never open, and if the flower has already unfurled, it will not have sufficient time to absorb the dye before it starts to fade. Make a fresh cut in the stem. If you have a long stem rose, shorten the stem to about 8 to 12 inches, so the dye does not have to travel so far. Using a sharp blade or knife, divide the stem into vertical sections, one section for each color. Cut about 3 inches up the stem. Don’t make more than 3 to 4 sections or the flowers will be too fragile to survive. Mix your dyes using food coloring and water. Use a good amount of dye (10 to 12 drops) so that the pigment will be saturated enough to really color the petals. To get the full rainbow, you can use red, blue, and yellow dyes. They will probably mix a bit on their way up the stem, creating the full rainbow effect and making each rose a little bit different. You are going to need to leave each stem section in the dye mixture for several days, so place the dye into narrow containers such as bud vases or test tubes. Each color will go into its own container. You could also use plastic bags attached to the stem sections with rubber bands, and then stand them all up in a single container. Be gentle when bending the stem sections apart, and try not to leave them exposed to air and drying out for more than a few minutes. Place the rose out of direct sunlight while it is absorbing the dye. The cut flower is already under stress, and extreme heat or light will weaken it further. Now be patient. You may notice the petals changing color within a couple of hours, but leaving them in the dye for up to a week will result in the most dramatic colors. Make sure the rose is not left sitting in a dry container once the water/dye solution is all absorbed. Once the desired effect is obtained, you can cut off the split section of stem and place your rose in a vase of fresh, room temperature water and enjoy. If you had fun coloring roses, you can branch out and try other flowers. Mums and carnations are said to be even better at taking the dye than roses. You could create a lovely rainbow bouquet.